I talked my way into the air control room for Kadena. It was busy, as expected, and the atmosphere was tense. Bad weather was moving in earlier than predicted. They would need to recover planes under thick clouds bearing heavy rain. Radar screens and radio stations received the keen focus of the controllers’ attention. Added to the mix was a flight of new B-29 bombers coming in for deployment at Bolo point to the northwest. Those pilots would likely be unfamiliar with the airfields and landmarks around them. Most of the landing strips here are parallel to each other, running with the prevailing winds. Controllers don’t need to give multiple headings and control crossing flight paths, if they can get each plane into the right corridor. They have a system for it, but sometimes it’s not enough. Late in the day, with minimal sunlight pushing through the low rain clouds, a B-29 came down in front of me, right on top of a smaller plane. The A-20 “Havoc” had just landed, gun belts and bomb racks emptied, coming to a slow roll only halfway down the generous runway. It was completely demolished. The pilot of the B-29 probably lined up on the wrong runway. We’ll never get the chance to ask him or his co-pilot. 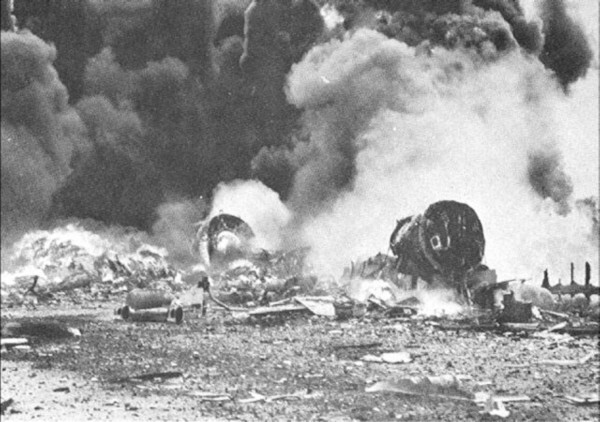 The nose of their bomber broke off cleanly and bounded down the runway in a violent twisting tumble. It remained intact but their bodies were shattered. I stood at the window watching ground crews scramble to put out fires and clear debris from the wet coral pavement. Calm but forceful voices behind me issued rapid instructions to dozens of inbound planes, diverting them to other fields. The rain kept coming into the night so I found a quiet corner of the base office block to camp in.